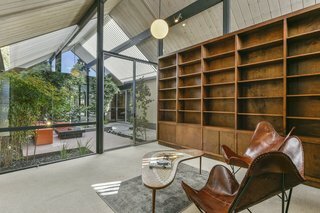 Designed by architect Claude Oakland, this 1969 home is one of just a handful of the Gallery Eichlers—which are also known as the "Super-Eichlers." 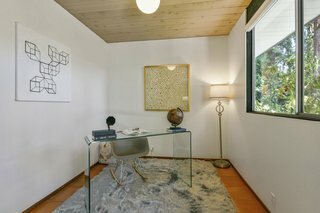 It's located in Walnut Creek’s Northgate enclave, which is the last tract of Eichler homes to be built in the East Bay. These models are coveted for their generous and well-designed floor plans—and 252 Clyde Drive is no different. 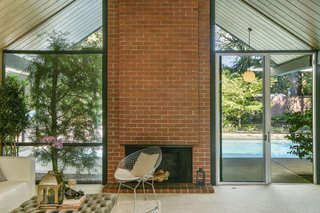 Intersecting lines and geometric forms make up the facade of 252 Clyde Drive. 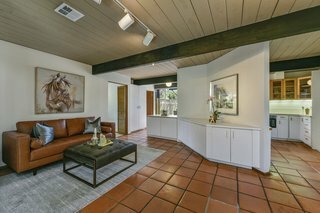 The five-bedroom, three-bath, home features 2,499 square feet of single-level living space and it's full of authentic midcentury charm. The design embraces a strong indoor/outdoor connection and boasts a stunning light-filled atrium, a spacious great room with walls of glass overlooking the pool, and a soaring wood-paneled ceiling. 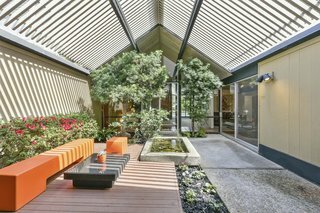 The sense of the outdoors is particularly strong in the central atrium; the space is awash in light and shadow. 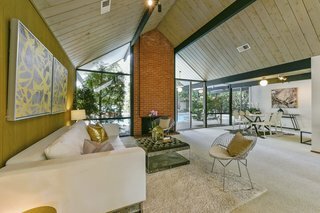 The great room has soaring ceilings and elegant midcentury lines. 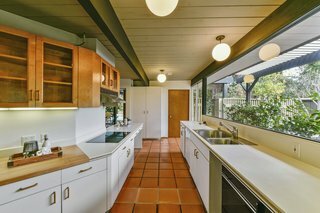 According to the listing, the home has been lovingly maintained by its original owner and features original details in excellent condition—including unpainted wood-paneled ceilings, globe pendant lighting, and original doors and hardware. 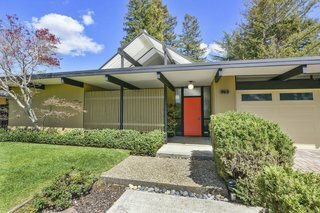 However, the quiet star of this midcentury gem is the master suite spa. 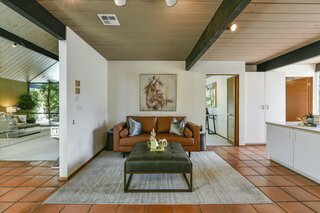 Tucked behind shoji screens, the serene, wood-paneled space is a 1980s addition and features large windows and sliding glass doors that lead to the backyard and a stylish solar-heated swimming pool. A bold wood-burning brick fireplace framed by glass anchors the open-plan living space. The living space as it relates to the dining area. 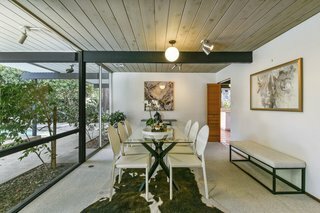 The post-and-beam construction in the dining room accentuates the indoor/outdoor connection. The den connects the great room to the kitchen. 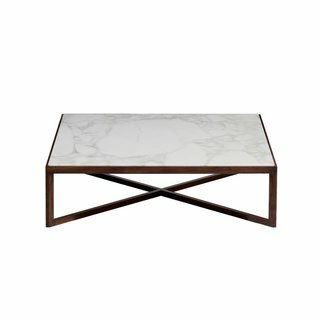 In keeping with the simple linear forms of the Krusin Chair series, the new Krusin Occasional Tables serve up clean, graceful lines in a range of finishes and table top options. 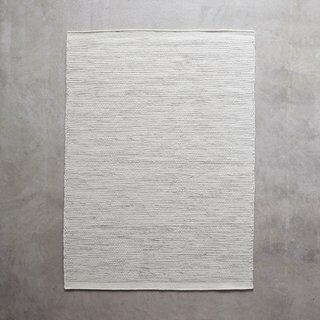 A great rug is the foundation of a room, adding dimension and instilling mood. The geometric flair of our Loop ivory rug brings life and fluidity into the picture. 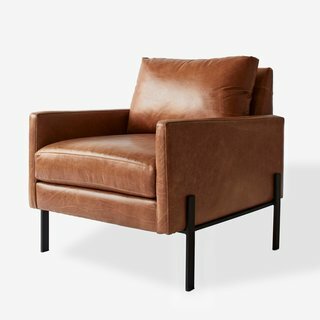 A chair you’ll want to spend hours in – reading, dreaming, scheming. The look: tidy and structured. The feel: beyond comfortable. It’s true that you won’t believe the buttery-soft leather in a cognac hue that will age ever so gracefully. It is essentially just one room, divided by a partition-like wall. The kitchen is flooded with light on both sides, providing an open, airy flow. 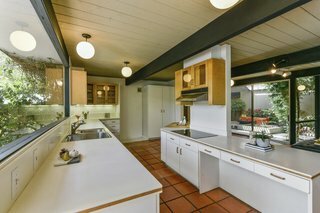 The kitchen has original globe pendant lighting and ample storage space. The fourth bedroom is also bright, open, and airy—benefitting from the vaulted ceiling as well as a direct connection to the atrium. 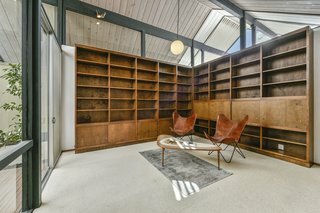 The room has two walls of built-in bookshelves and would make a lovely light-filled library. 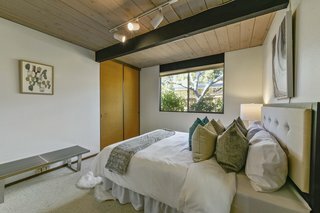 The second and third bedrooms are classic Eichler sleeping spaces. 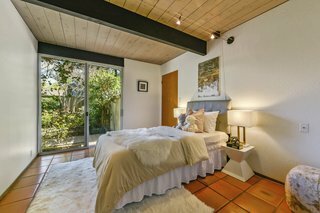 The fifth bedroom features sliding glass doors that lead to the garden. This is the "hobby" room. 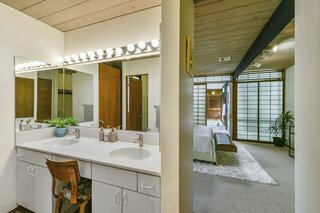 As you enter the master suite, a bathroom lies to the left. 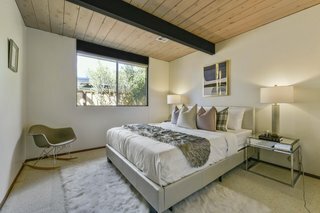 The master bedroom has a Japanese vibe thanks to shoji screens, which slide to reveal the home's hidden highlight. 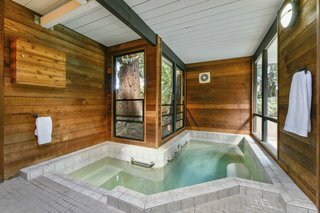 Tucked behind the shoji screens is a spectacular spa with cedar-paneled walls, large glass windows, and a sliding glass door leading to the backyard. 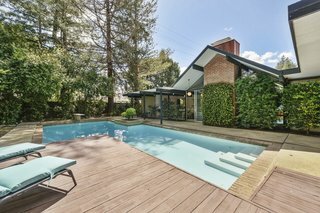 The backyard features a solar-heated pool. 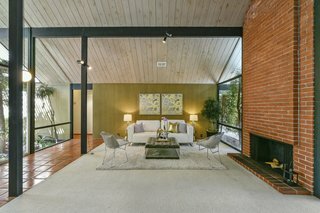 252 Clyde Drive is currently listed for $1,500,00 by Thomas Westfall of Alain Pinel Realtors.